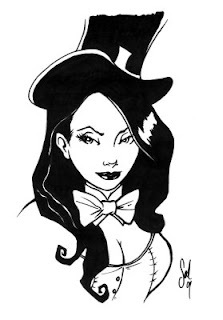 The Tanoshiboy Chronicles: Design & Illustration Blog: Please meet my wife...Zatanna! Last night I was watching Smallville (Yeah, big woop. Wanna fight about it?) and they had Zatanna on it! Those of yous guys that don' know, she's the DC's resident magic character. Go ahead and learn yerself some stuff. Her power comes from saying her spells backwards. So for instance, "yawa go!" would be "Go away". Surprisingly some people still don't know that about her. Anyway, I dig Zatanna. I always thought she was way hot and kiiiiinda had a geek crush on her (It's the fishnet stockings). So I decided to draw her, BUT...I remembered that my lovely wife dressed up as Wonder Woman for Halloween last year and so that inspired me to draw up my wife as Zatanna (which would be awesome!). So there you have it! My "ole' lady" as the Mistress of Magic! maybe i do want to fight about it.